He is found in the Palace of Vivec, the southernmost canton of his city, which boasts the extensive Puzzle Canal and the Shrine to Vivec. Vivec has a large amount of unique dialogue. "I expected you. We have business, you and I." ""The blight is gone, and we have survived. Now we must dedicate ourselves to rebuilding the Temple. And you must dedicate yourself to your responsibilities as Protector of Morrowind." Almalexia: "We don't communicate. Without the Heart, our divine powers must diminish. She takes her divinity very seriously, and the loss weighs heavily on her. She tends to brood, and I fear she will do herself and others harm." bitter recriminations: "You want to chide me... why did I murder Nerevar? why did I break my oath to Azura not to use Kagrenac's tools? why did I cause others to suffer?" break my oath: "Along with Lord Nerevar, and at his insistence, Almalexia, Sotha Sil, and I swore before our god of oaths at the time, the Daedra Lord Azura, never to employ the tools of Kagrenac for any purpose. We broke our oaths. We turned our backs on the old gods. I still see no compelling reason to worship any of the Aedra or Daedra. But, for the respect I held for Nerevar, and the respect I held for myself, I should never have betrayed my oath. Of all my life's actions, I most regret that failure." cause others to suffer: "Why did I cause others to suffer? I respect that question, and you for it. The most I can say is: I did the best I could, as I saw things. Can you, mortal, presume to judge the actions and motives of a god? But, because I need you, and you need me, I will make an accounting for my sins, to you. But not now. Destroy Dagoth Ur, and then we will discuss my sins. Then, perhaps, you will have earned the right to judge me." Counsel: "You need to know... where is Dagoth Ur? What are Dagoth Ur's plans? Who are Dagoth Ur's servants? Who is Dagoth Ur? What are Dagoth Ur's powers? What is known about Dagoth Ur's defenses? How can I prepare for battle against Dagoth Ur? Who can help?" "Dagoth Ur is the former Lord High Councilor of House Dagoth. He was of Lord Nerevar's generation, older than we, and a mighty sorcerer and enchanted [sic] in life. In his sustained shadow immortality, he appears to be a highly intelligent, severely deluded immortal monster with unparalleled supernatural abilities. He appears, by turns, lucid and deranged, compassionate and bestial, profoundly wise and profoundly disordered. In short, he is a mad god." "He was a god, and now he is dead. IF one can truly kill a god." Dagoth Ur winning: "Dagoth Ur is winning because he is close to the source of power, Lorkhan's Heart. And because he retains the passion of madness, while we have settled into the lonely and unrewarding posture of dogged dutifulness and perseverance. And, finally, perhaps because he is stronger and smarter than we are, and his followers are more fervent and fanatical. I believe we were careless and complacent, and out-witted. And, in the matter of denying the Nerevarine, we were foolish." Dagoth Ur's defenses: "Confer with the Ordinators and Buoyant Armigers garrisoning Ghostgate for the latest information about the defenses of the citadels of Dagoth Ur and his heartwight kin." [Dagoth Ur's Plans has been added to your inventory.] "We know nothing for sure, but we have learned much from interrogating Sixth House cultists and victims of dream compulsions, and from our study of Dagoth Ur's actions. The Temple scholars and Inquisitors have prepared a document, 'Dagoth Ur's Plans,' that summarizes what we know or suspect. Take this copy. It's also available in my library." "'Dagorh Ur's Plans' summarizes what we know or suspect. You have a copy. It's also available in my library." Dagoth Ur's powers: "He is able to send his mind into the dreams of susceptible victims across vast distances. The victims are either swayed by his compulsions or driven mad. He also seems nearly invulnerable to physical and magical harm. His flesh, and the flesh of his followers, evolves towards a mutable, magical form. Dagoth Ur and the highest ranks can control the distorted manifestations of their flesh; lower ranks lose control of their bodies, and become mindless corprus monsters." Dagoth Ur's servants: "Chief among his servants are his seven brothers, the ash vampires, powerful heartwights and cunning sorcerers of old. These creatures appear to die, but always are revived at the Heart. Somehow Dagoth Ur has conferred some portion of his immortality upon them. Or perhaps they sustain themselves through more conventional sorcery." "To defeat Dagoth Ur, go to Red Mountain to recover the artifact hammer Sunder from Gate Citadel Vemynal, then recover the artifact blade Keening from Gate Citadel Odrosal. Then proceed with Wraithguard, Sunder, and Keening to the citadel of Dagoth Ur. Within the citadel, find the Heart of Lorkhan. Use the three artifacts to sever Dagoth Ur's connection to the Heart, and he will be destroyed, and the Blight ended on Morrowind. [Plan to Defeat Dagoth Ur has been added to your inventory.] To destroy Dagoth Ur, you must sever his connection with the Heart of Lorkhan. To do this, strike the Heart with the artifact hammer Sunder once, then strike the Heart more than once with the artifact blade Keening. You must wear Wraithguard, because you cannot handle either Sunder or Keening unless you are wearing Wraithguard. That is the short, simple explanation. Here is the long, detailed explanation, written down for your convenience. Read it, study it, commit it to memory." "I have given you a copy of my proposed plan. Read it, study it, commit it to memory." divine powers: "Almalexia, Sotha Sil, and I gained our divine powers from the Heart of Lorkhan. And now we no longer have access to the Heart, so we must lose our divinity. I have always worn my divinity lightly -- fundamentally, I am not at all a serious person -- and I will not miss it. I have tried to do what was necessary. I am afraid I have done some harm. I assure you -- I will be quite content to be a mere mortal again, dedicated to my own amusements." Dwemer's sin: "The sin of the Dwemer was the creation of a new god from the substance of a dead god, Lorkhan. That is also the sin for which we would destroy Dagoth Ur. I hesitate to call it 'sin'. More properly, call it 'destructive evil'. The sin of the Tribunal, however, is in the breaking of an oath to Azura to forebear from tapping the Heart with Kagrenac's tools, and in the folly of seeking to become gods. Breaking the oath was evil. Becoming gods was folly. If we sinned, we have paid the price." explanations: "You want to know... why did I wage war on the Nerevarine? Why did I try to suppress the Apographa? Why did I persecute the Dissident Priests? Why is Dagoth Ur winning this war? How does the Tribunal fight Dagoth Ur? What are Wraithguard's powers?" much to do: "There are many blighted beasts and horrors that have survived, and must be hunted down and destroyed. There are lesser monsters and villains of all kinds who prey upon the people. There are unsolved mysteries, and legendary treasures undiscovered. I'm sure you will find much to occupy you." murder Nerevar: "We did not murder Nerevar. The legend that we murdered Nerevar comes from a story told by a shield-companion to Nerevar, Alandro Sul, who lived among the Ashlanders. The Ashlanders have retained Alandro Sul's account as part of their oral histories. The account is persuasive in some details, implausible in others, and is in any case false. I have two accounts of Nerevar's death here in my library. Read them, and judge for yourself." my library: "I want your trust. And willing cooperation. So I've had the priests make copies of a number of documents. They're here for you to read or take with you. Take a look at them. Help yourself." "I love the people of Morrowind. I became a god to make their lives more comfortable and secure. I am most close to my faithful followers; I am literally in their hearts and minds. I feel the most sympathy with House Redoran; they are Dunmer driven by creeds and deeds, like I am. House Indoril is closer to the compassion and sympathy of Almalexia, a comfortable and secure serenity. House Telvanni matches the disposition of my brother Sotha Sil -- iconoclastic, profane, unconventional. House Hlaalu represents the future of the Dunmer, integrated into the sophisticated mainstream of the traditionless, raceless, godless culture of the Empire. House Dres represents the past of pre-Tribunal Great House culture, a persistent tradition of Daedra- and ancestor-worshipping civilized Dunmer clans. And I even love the Ashlanders for their preservation of the most ancient barbarian tribal traditions of the Dunmer who first settled Morrowind." persecute the Dissident Priests: "Suppression and persecution of dissent is just one of the standard tools of statecraft. I believe we erred in trusting the judgement of Berel Sala. He and his Ordinators served valiantly in the war against Dagoth Ur. We mistook his misplaced zeal for energy and dedication. Mistakes were made. But no more. There shall be no more persecution of the Dissident Priests, and I hope both sides shall swiftly be reconciled." prepare for battle: "Prepare for war. Beyond the Ghostfence, there are no safe places, no allies. Stockpile resources. Plan for retreat and replenishment. Quest for artifacts of power." Protector of Morrowind: "There is much to do. You still have Kagrenac's Tools, potent weapons, and the wit and experience of a proven hero. The Tribunal and the Temple are happy to yield to you the duties of fighting the enemies of Morrowind." questions: "You are curious... what really happened at Red Mountain? What really happened to the Dwemer? What was the Dwemer's sin? What is it like to be a god? Do I remember being mortal? How do I feel about the people of Morrowind?" rebuilding the Temple: "There are still issues to be resolved between the Temple and the Dissident Priests. And now that our greatest enemy is gone, we must reorganize the Temple to meet the needs of the people. We have less need of Ordinators, for example, and greater need of priests and healers and teachers. And we must find time to mourn and honor the dead." Red Mountain: "In my library, I have made available two conflicting accounts of the events of Red Mountain, my own true account, and another false account common among the Ashlanders and preserved in the Apographa. I don't care whether you believe my account or not. I leave it up to you to judge which is true." Not quite no more feeling. I still want to win. I want to defeat Dagoth Ur. Perhaps I have lost the feeling for the people, for their suffering. I don't want that feeling. It is no use to me. That is no longer what matters to me. I only want not to lose. To lose would be very, very bitter." reorganize the Temple: "Without the power of the Heart, our divine powersdiminish. Our days as gods are numbered. I have told my priests that I shall withdraw from the world, and that the Temple should be prepared for a change. We may be honored no longer as gods, but as saints and heroes, and the Temple will return to the faith of our forefathers -- the worship of our ancestors and the three good daedra, Azura, Mephala, and Boethiah. The missions and traditions of the Temple must continue... but without its Living Gods." Sotha Sil: "I do not hear from him since our defeat at Red Mountain. Truly, I scarcely ever heard from him. He is completely self-absorbed. Like myself, without the Heart, his divine powers will diminish, but I doubt he will notice the loss. He is fascinated by the hidden world and its mysteries, and I doubt he even notices us most of the time." suppress the Apographa: "Why did I suppress the Apographa? Because it was such an unfortunate mixture of truth, falsehood, and speculation that I couldn't afford to manage the confused reaction of our faithful. Any doubt whatsoever weakened their faith, and we needed their faith to give us the power to maintain the Ghostfence. In retrospect, perhaps we lost the faith of those we most needed while preserving the faith of the meek and indifferent. Perhaps a mistake was made. Who can say?" the Dwemer: "I have no idea what happened to the Dwemer. I have no sense of them in the timeless divine world outside of mortal time. And, in fact, if I did believe they existed, I would be in no hurry to make contact with them. They may, with some justice, hold the Dunmer race responsible for their fate. My intuition is that they are gone forever -- and that is perfectly fine with me." "It is like being a juggler. Things are always moving, and you learn to know where they are without even thinking about it. Only there are many, many things moving. And sometimes, like any juggler, you drop something. I'm afraid it has become a lot more a matter of dropping things lately. There's too much to do, and not enough time, and I'm losing my touch. Perhaps I'm growing old. It is a bit like being at once awake and asleep. Awake, I am here with you, thinking and talking. Asleep, I am very, very busy. Perhaps for other gods, the completely immortal ones, it is only like that being asleep. Out of time. Me, I exist at once inside of time and outside of it. It's nice never being dead, too. When I die in the world of time, then I'm completely asleep. I'm very much aware that all I have to do is choose to wake. And I'm alive again. Many times I have very deliberately tried to wait patiently, a very long, long time before choosing to wake up. And no matter how long it feels like I wait, it always appears, when I wake up, that no time has passed at all. That is the god place. The place out of time, where everything is always happening, all at once." Tribunal fight Dagoth Ur: "In the past, the Tribunal made seasonal campaigns to Red Mountain. We slew Dagoth Ur and his kin, though the Heart always revived them in time. Later, when we realized we couldn't destroy them, we created the Ghostfence to contain the threat. These solutions were effective until Dagoth Ur ambushed us and captured Sunder and Keening. Since that time, our fortunes have waned as his increased." war on the Nerevarine: "Why did I try to kill you? Because you threatened the faith of my followers, and I needed their faith to hold back the darkness. And I thought you were my enemy -- a pawn of the subtle Daedra Lord Azura, or a pawn of Emperor Uriel Septim, or a simple fraud -- perhaps a Hero -- but not much of one if my faithful could destroy you. Now circumstances are altered. I need you, and you need me." we have survived: "We have lost our divine powers, but not altogether. Some token of the people's faith remains, and we shall dedicate it to rebuilding the Temple. Now that Dagoth Ur is gone, we can turn our energies to the more humble needs of the people. It is good, honest work, and I believe there is redemption in it." where is Dagoth Ur: "Dagoth Ur has never ventured out of the Heart Chamber, the place under Red Mountain where the Heart of Lorkhan lies. It is there, or nearby, that he is constructing a new god, Akulakhan, also known as Second Numidium." who can help: "Ordinators and Buoyant Armigers stationed at Ghostgate have the most practical knowledge of the nightmare world inside the Ghostfence. Seek them in my name for counsel and aid." Wraithguard's powers: "Wraithguard's primary function is to protect the wearer from the fatal energies of the artifacts Sunder and Keening. It also has minor protective enchantments against physical and magical damage that you may find useful." Vivec is also one of the very few characters to believe you about Almalexia's and Sotha Sil's tragic deaths: "That is very sad. I presume Almalexia killed Sotha Sil. I thought she might harm me. And I presume she tried to kill you, Nerevarine. It is all very sad. But death comes to all mortals -- and we are all mortal now. In time, death will come to me, Nerevarine -- perhaps even at your hands. It is futile to deny one's fate. But, nonetheless, I'm afraid I find it all very, very sad that it should end this way, something that began in such glory and noble promise." 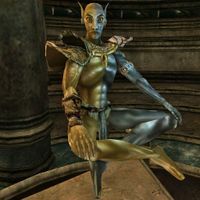 Vivec's soul may be captured with a Soultrap spell, but only if you have Azura's Star, as no other soul gem is powerful enough to hold his soul. Vivec's soul is second in size only to that of Almalexia in the Tribunal expansion. These two are the only souls large enough to require the use of Azura's Star to capture them. In the Morrowind Game of the Year Edition for Xbox, Vivec and Ascended Sleepers use werewolf sounds when hit. Although Vivec has some voice files, they weren't included in the game. They can be found in the Data\sounds\vo\misc directory on the game's installation disc. One was alarm dialogue: "I won't let you do that." Two were dialogue for attacking an enemy: "Foolish mortal." and "Don't fight gods, fool." One line of dialogue was a laugh for when he is hit in combat: "Hahah!" One was a greeting: "Yes, Incarnate. I am Vivec and I can answer all of your questions." One was idle dialogue: "It is lonely to be a god." Esta página foi modificada pela última vez à(s) 13h35min de 4 de outubro de 2015.